The 2017 American Society of Clinical Oncology (ASCO) Annual Meeting was held in Chicago, Illinois, 2nd-6th June 2017. 1. Could you please briefly explain the study you presented at ASCO 2017 and why it is important? My presentation covered the first adjuvant phase III randomised trial in UM based on genomic and clinical risk of metastasis. It demonstrated that Real-time Comparative Genomic Hybridization (CGH) is feasible in a multicenter study, and how important an intensive follow-up by a medical oncologist is for early detection of asymptomatic liver metastases. 2. Fotemustine is a chemotherapeutic agent already approved for treatment of metastatic cutaneous melanoma. How different was fotemustine through to be from the standard of treatment in UM? At the time of study design (2008), Fotemustine was the agent with the best ORR (objective response rate) in metastatic UM. No targeted agent was available then, nor immunotherapy. 3. Even though no statistically significant differences were found between the chemotherapy and surveillance groups, FOTEADJ demonstrates multicenter adjuvant studies are feasible for a cancer as rare as UM. What do you see as the most important lessons taken from FOTEADJ for future UM clinical trials? FOTEADJ highlighted two important notes: on one side, the importance of genomic analysis of the primary tumour as a standard of care for UM patients in reference centers; but equally the need to stratify patients regarding their risk (clinical/genomic) and definition of follow-up guidelines/inclusion criteria for future adjuvant trials. 4. Are you currently involved in any other UM clinical trials? In so, where can UM patients find more information on them and other trials? Yes, more specifically in multicenter international trials dedicated to metastatic patients. UM patients may find more information on them and other trials at the Institut Curie website. 5. 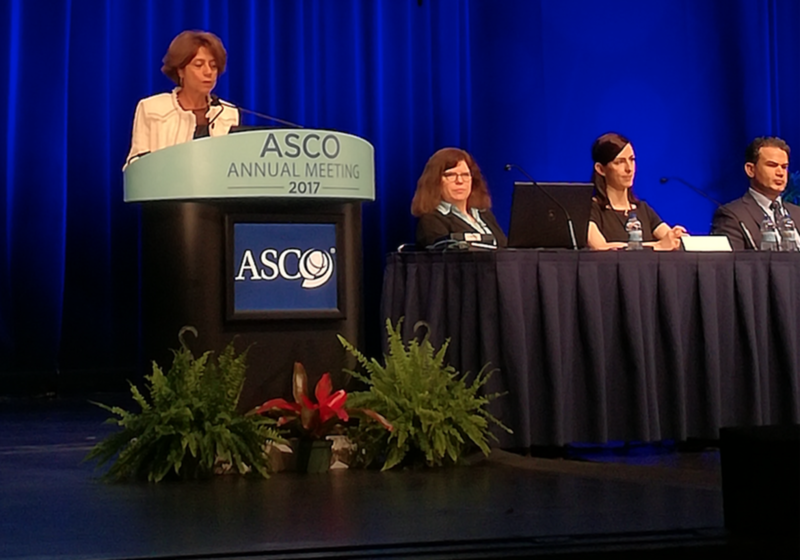 What are the advantages of presenting your work at a conference as important and massively attended as ASCO? The advantages of presenting our work at a conference as ASCO are tremendous. For one thing, there is the visibility it brings to rare tumours such as UM, in terms of clinical research, as compared to the huge acceleration of the skin melanoma field. There is also the hope it brings to patients, as some centers are working on their rare cancer, they can identify us and help us going faster and further. Ultimately, it means acknowledgement of our work for all our years working with such a challenging disease.